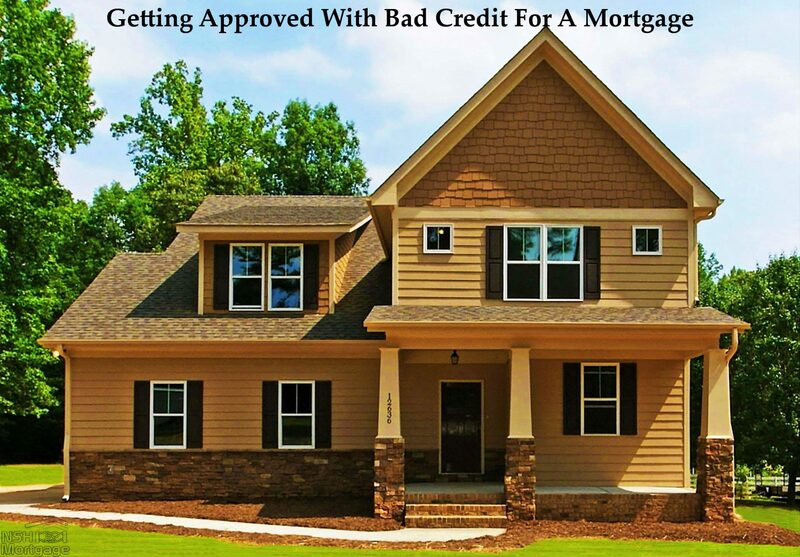 Getting Approved With Bad Credit For A Mortgage. NSH Mortgage has the knowledge and tools to help you get approved no matter the credit score that you have. Many people with fair credit thinks they cannot get a mortgage. After all, those with fair credit are not among the credit score elite those individuals with credit scores of 800 or more. Instead, fair credit borrowers are likely to have some late payments and maybe even a missed payment or two. But, there is some good news, you can get a mortgage with fair credit. In fact, savvy lenders may be very interested in your business. Before you can figure out how to get a mortgage, you must understand what fair credit really means. This is a problem because the definition of fair credit is fuzzy. Like beauty, it is in the eye of the beholder. Experian®, one of the three big credit reporting bureaus, says fair credit includes credit scores from 580 to 669. About 28 percent of consumers with a credit score between 580 to 669 are likely to become seriously delinquent in the future. The catch is that not everyone agrees. An Internet search can find a variety of fair credit definitions, none of them alike. Not only that, what is fair credit one day might be something else tomorrow as lending standards change. For our purposes, let’s say that fair credit ranges from 620 to 699, numbers high enough to interest many lenders. If you think that mortgage requirements have gotten tighter during the past few years, you are right. “Only the best borrowers are getting loans today and these loans are so thoroughly scrubbed and cleaned before they are made that hardly any of them end going into default,” reports the Urban Institute. A near zero default environment is clear evidence that we need to open the credit box and lend to borrowers with less than perfect credit. While lender requirements may have tightened, there are two important points to be made. First, there are loans available to those with fair credit. Second, you can improve your credit standing with a little strategic planning. Lenders need borrowers with fair credit. That is because lenders have an overhead. Borrowers in every credit spectrum help them bulk up profits and stay in business. Not every borrower has a 800 credit score. It follows that lenders must also consider borrowers with fair credit as a way to maximize production and profits. In effect, lenders want those with fair credit to get financing. FHA mortgages allow borrowers to finance with 3.5 percent down, providing they have a credit score of at least 580. Below 580, there is a ten percent down payment requirement. Also, manual underwriting is now required for borrowers with credit scores under 620 and a high debt to income ratio. In other words, lenders will want to check every number for borrowers without pristine credit. The VA does not have an official credit score minimum. However, actual VA lenders may add their own credit score requirements, and many do typically, 620 to 660. VA loans are available to home-buyers with eligible military experience, and can be had with no money down. The new Fannie Mae HomeReady™ mortgage, and the Freddie Mac Home Possible Advantage® are two examples of three percent down conventional loans. A variety of new private sector offerings are all available with three percent down. Many have flexible underwriting guidelines for those income does not exceed eligibility limits. Certain portfolio, non-QA or so called “Alt-A” products. These have higher down payment requirements and interest rates, but are geared toward those with lower credit scores. It may well be that you have the fair credit today, but this need not be a permanent condition. Your credit standing can change, and it can change with some speed. The pioneering FICO brand credit scoring system uses five factors to rate your financial standing. Each factor has a certain weight on your credit score. These categories suggest three quick steps you can take to get better credit. First, do not open new accounts. When a retailer offers $10 off if you will use their credit card, you are being asked to open a new line of credit. Do not be tricked. Since new accounts hold down credit scores, you are better off paying the $10. Second, credit history is important, but most important of all is recent credit history what you have done in the past few months. Make a point to pay all bills in full and on time. This is not only good for your credit standing, but will also end costly and unnecessary late payment penalties. Third, review your credit report. A 2013 study by the Federal Trade Commission found that five percent of consumers had errors on one of their three major credit reports that could lead to them paying more for products such as auto loans and insurance. How big an error? At least 25 points enough to change an individual’s credit standing. If you find outdated or erroneous information, remove it with a rapid re-score. This service can cost a few hundred dollars, but can raise your score by 100 points or more in days. You can get a free copy of your report at AnnualCreditReport.com, a website authorized by federal law. Do you see any factual errors? Outdated information? Mistakes can lower your credit standing, and perhaps substantially. If you see problems contact the credit reporting agency immediately and ask how to get the offending items removed. So yes, you can get a mortgage with fair credit, but even better, you can improve your credit standing a sure path to lower rates and easier mortgage applications.